The lengthy preview mostly focuses on Sarah Paulson’s conjoined twins Bette and Dot Tattler, who don’t seem excited about entering the “gates of hell,” otherwise known as the Freak Show. Bearded Lady Ethel Darling, played by Kathy Bates, tries to talk some sense into the twins, one of which claims, “We’re no one’s trained monkey.” While Bette and Dot are ushered into a new world, the regular world is not always so happy to have the Freak Show around. The members of the troupe are regularly bullied by outsiders, but as the trailer shows, maybe the outsiders should be wary of what lies beneath the big top. At the end of the preview, we get a look at the Florida troupe’s scariest clown, Twisty. 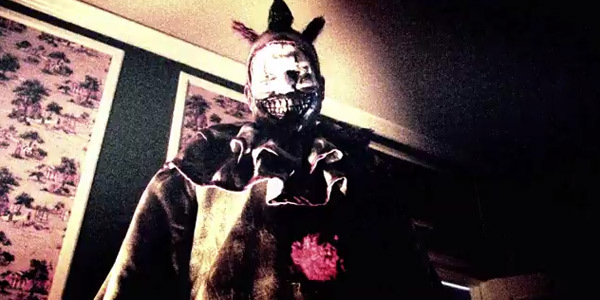 We’ve known for quite some time that Ryan Murphy believes the American Horror Story: Freak Show clown is “the most terrifying clown of all time.” The show has already released teasers showing some creepy clowns, but we haven’t gotten a look at the main clown, who will be played by veteran actor John Carroll Lynch. That all changed in this preview. Twisty is shown in a sequence toward the end of the video, waking up a young lady in her sleep in what looks to be a home invasion sequence. I can’t think of a worse way to die than by getting attacked by a grotesque clown in the comfort of my own home. Maybe a sinkhole, but that’s a different kind of terror. Today, American Horror Story: Freak Show also released the opening credits for the series. Those don’t offer a big reveal like the horrifying glimpse at Twisty. Still, they are creepy in their own way, and worth a watch for serious American Horror Story fans. FX’s American Horror Story: Freak Show is set to premiere on Wednesday, October 8 at 9 p.m. EST. You can take a look at the rest of the fall premiere dates, here.